A New Jersey Apple Store will reportedly be the first in the chain to build a double-row Genius Bar as the company experiments with new in-store layouts to alleviate overcrowding. 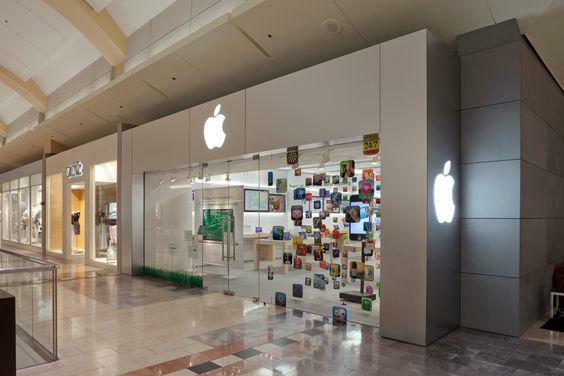 According to blog ifoAppleStore, the Garden State Plaza Apple Store, which opened in 2006, will be trying out the new arrangement when it moves to a larger space that will nearly triple the store's square footage. Sources say the new setup will consist of two Genius Bars aligned parallel to the rear wall, allowing "360-degree access" to Apple staff. Apple is said to be making tweaks to its brick-and-mortar retail outlets in attempts to cope with an increasing number of visitors and subsequent raised customer demand. The Garden State addition is one of a number of changes Apple has made to the Genius Bar's layout in recent months, the first being a "floating" unit in California which is arranged perpendicular to the rear wall, while a Washington location opened two weeks ago with an unusually long version that extended nearly the entire width of the store. According to the publication, the Apple Store in Amsterdam hold the record for the longest Genius Bar, with a single 82-foot long table placed in front of a 165-foot wall. Apple Stores have been in the news recently as new Senior Vice President of Retail John Browett reportedly made a number of cutbacks in a supposed push for larger profit margins. In the quarter ending in June, Apple's retail stores raked in $4.1 billion, an increase of 17 percent from one year prior. Nine new Apple Stores were opened during the quarter, bringing the total up to 373 worldwide, with per store revenue hitting an average of $11.1 million.